For most people, this would be a “set and forget” page. However, one of the aspects of my work is that my location changes far more frequently than normal. 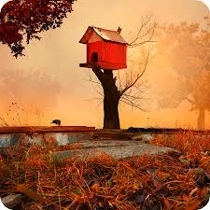 So if you go away for a while and return, you may see that it has changed. If you do, it merely means that I have moved—again. The three biggest centers of my life are home, work and church. And so I have three main sections here, one dealing with each. At the bottom is a list of addresses and other contact information. Do feel free to contact me, if you desire. I may not get back to you right away, but unless you give me reason not to, I will eventually reply. You can also find links to my newsletters and updates for the previous 12 months here. I am currently living in a kitchenette at the main ALEM headquarters just north of the city of Brasília. While I have visited the ALEM center many times in the past (see the page about my Work; specifically the BSB Trip Reports for some examples), this is the first time that I have actually lived here long-term. Usually, I have stayed in the dormitory, but while good for visits, it is not the type of lodging where I would choose to live permanently. Therefore, the ALEM administration has provided this kitchenette, which I am currently renting. While the kitchenette has a fully-equipped kitchen, I nevertheless prefer to eat my main meal in the refetório, or dining hall. This saves time, and is somewhat more economical of food costs. The fare is good and there is a good variety. Unfortunately, the dining hall is not open during the months when the ALEM linguistics course is not in session, and at that time I prepare all of my meals at home. The ALEM center is located a few kilometers out of town. The environment is rural, which I definitely prefer over city life. Without all the asphalt found in the city itself, it is also somewhat cooler, which is more comfortable and makes for easier sleeping at night. Electricity is fairly reliable, and the center has its own well. Telephone and Internet are not as good, due to issues with the cable providing the service. This has been an ongoing battle for years. City buses pass fairly often at a point about a half-kilometer from the center, and one of them actually passes in front of the main gate several times per day. My primary work assignment is to provide technical computer support at the ALEM headquarters in Brasília. In addition, I also provide support for staff and students at the regularly-held Mother Tongue Translator courses held elsewhere in Brazil, as well as remote support for members of SIL Brazil. To help in this task, the administration of ALEM has provided space for me in an office in their primary classroom/office building at their headquarters. Unlike the SIL office in Anápolis, the ALEM center is more similar to the old SIL centers in places like Cuiabá and Porto Velho. In addition to the main office, there are individual homes, apartments, dormitories and a dining hall, plus maintenance buildings. Wireless access points provide network service beyond the office, and requires regular maintenance. There is a computer room for students taking the linguistics course. Due to the necessity for improvements in service—and increasing availability of better options—we have been in a state of slow but steady upgrading for years. Another part of my job in Brazil involves the Tradutores Indígenas da Bíblia (Indigenous Bible Translators) course, which is held near the small city of Chapada dos Guimarães (site in Portuguese) at the AMMI Bible School. (For more information about AMMI, see the section on the page about Cuiabá.) The purpose of this course is to train many of the indigenous people that we work with to actually do translation work into their own language. This course consists of three 3-week modules, held in January, July and the following January. During the course, the students receive computers specifically for the work, and part of my job is to not only set up these tools for the students to use for their work, but to help maintain them afterward. And, of course, I must not forget to mention SIL Brazil, of which I continue to be a member, even though I now work at the ALEM center. SIL is still involved in a lot of Bible translation work, and I make regular trips over to Anápolis to provide technical support for the office, for special events like our annual Conference, and for individual members. This is my basic job description. However, while doing field training back in the early '90s, I learned one of the organization's mottos, which is “be flexible.” This means that I need to be available to give help even for issues that lie “outside the box”. After all, the real purpose is to bring God's word to people everywhere, and there really aren't any limits to that. On the page about Billiard's Work, there is a section called Getting the Job Done, where I talk about financial needs that must be met in order to be here doing this job. In that section, I describe a monthly financial support quota that is set by Wycliffe Bible Translators and that I must raise by telling people about the work God has called me to do—and trusting Him to move the hearts of those whom He has called to make this a part of their minstry for the Kingdom. The graph at the right shows the percentage of this quota that I am currently receiving. To read more about this and other needs that those of us serving in this ministry have, please see the Three-Fold Challenge. When I first started living in Brasília, I did not have a car or any way to get to a church, other than by using a group vehicle or by asking for a ride. Now I had been to a local Baptist church a couple of times—and found out that they had an on-line stream of their Sunday morning services. Also, they were the only church in the area that actually had services on Sunday morning, instead of just Sunday School. So I started watching. And I found the preaching challenging and spot-on with respect to the Word of God. Later on, when I finally got a car, I started going in person. 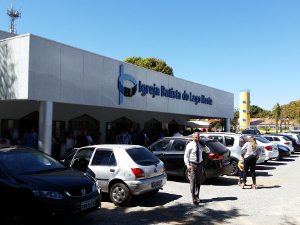 This church—Igreja Batista do Lago Norte (North Lake Baptist Church)—belongs to the same convention as the church I attended in Anápolis. In fact, it turns out that the pastors of the two churches even know one another. So in some ways it's like I never moved. And it is not too far away. Brasília is very spread out, and one thing that I had prayed for was a church that did not require a half-hour to 45 minutes to get to. IBLN is close enough to get to in around 15-20 minutes, and the traffic is relatively light. So in addition to finding a good church solidly founded on the Word of God, I also found a church that is easy to drive to. And it has been a blessing to get to know people, including participating in a semi-weekly Bible study at the house of one of the member families..